Outsourcing Legal Research and Writing. By outsourcing you can acquire increased research resources and add my knowledge and experience to yours. I have 25 years' experience, focusing on legal research, writing and the handling of appeals in Massachusetts courts. Outsourcing lets you take on additional work without having to hire a new associate. By outsourcing, you can regain control of your schedule while ensuring that your client receives the highest quality legal research and writing. An appellate brief demands extensive research and exacting attention to detail. Have your appellate brief prepared by an experienced Massachusetts attorney who understands the appellate process. Receive signature-ready motions and supporting memoranda, including: motions for summary judgment, motions to dismiss, motions to compel, motions for injunction, and many others. Obtain an objective analysis of the legal issues, including potential claims and defenses and their likelihood of success. Know the strength of your position and that of your opponent. When everything is due at once, when your practice has expanded but you don’t want the expense of hiring a new associate, or when you just need a vacation, let me lighten your research and writing burden. I’m Roger Manwaring. I have more than 25 years’ experience as a Massachusetts attorney specializing in legal research and writing and the handling of appeals. After many years with a midsize Boston law firm, I started Lawyers’ Legal Research & Writing to provide high quality, cost-effective, outsourced legal research and writing services to Massachusetts lawyers in private and corporate practice. Whether you need a quick list of citations or want to delegate an entire appellate brief, I can help. No project is too large or too small. Regardless of the project, Lawyers’ Legal Research & Writing offers exceptional research and writing at affordable prices. I never exceed an agreed-upon flat fee or budget. Take control of your schedule. Researching and writing a winning brief takes time that you may not have. By outsourcing to Lawyers’ Legal Research and Writing, you can regain control of your schedule while ensuring that your client receives the highest quality research and writing. Outsourcing lets you take on additional work from new or existing clients without the expense of hiring a new associate. By outsourcing on an as-needed, contract basis, you increase profits while avoiding additional fixed overhead costs. You probably don’t specialize in legal research. As a provider of outsourced legal services, I do. I’m likely to complete your project more efficiently than you could yourself, thereby reducing your costs and saving your client money (even if you add a reasonable profit). Make a profit on outsourced research. When you outsource legal research and writing, you can improve your bottom line by charging your client a premium, above the amount you pay me, so long as the total charge is reasonable. Since I likely charge less than you would for the same work, you can make a profit. As a solo or small firm attorney, you may have limited resources to devote to legal research. However, as a provider of outsourced legal research and writing, I have access to a broad array of electronic and traditional research sources. By outsourcing, you can level the playing field, litigating successfully against larger adversaries. I recently retained Roger to assist me with a rather complex opposition to a Motion to Dismiss in Federal District Court. I had a very limited time to respond and address issues involving federal jurisdiction, minimum contacts, the Long Arm Statute and forum non conveniens, among others. Roger’s work product was exceptional and delivered on time as promised. The resulting memorandum was delivered to me ‘signature ready’ and formatted for e-filing with the federal court. His writing is concise and his arguments are well considered. It is clear to me that he puts a considerable amount of research and effort into his work and his legal writing is technically superb. I recommend Roger without hesitation. My only concern is that in time he’ll be too busy when I call again! 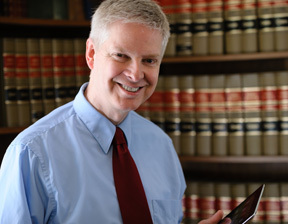 Kevin R. Leeper, Esquire, Massachusetts attorney specializing in immigration law. Roger excels at writing appellate briefs and difficult dispositive motions and oppositions. I trust that work assigned to him will be done on time and will meet the highest professional standards. In short, a project given to Roger is one I don’t need to worry about. Roger has done work for me on a wide range of legal issues. In every case, he has added value and benefited my client. Roger is an absolute pleasure to work with and I recommend him without reservation. He is the best legal researcher and writer I have encountered in my 19 years of practice." If you need the services of the best brief writer in Boston, call Roger Manwaring. Before I retired from practice, in December 2011, Roger worked with me at Barron & Stadfeld, P.C. for many years, assisting with pleadings, motion practice, trial memoranda and appellate briefs. I depended upon him for his keen intellect, quick grasps of legal issues, skill at legal research and his ability to write clearly and succinctly about even the most complex of legal and factual issues. Among his other great talents are his ability to function well under pressure and to be very efficient in the use of his time. I always felt that the two of us could, and did, compete successfully with much larger law firms that assigned numerous attorneys to a case." Roger is an exceptionally talented legal researcher and written advocate. He is a skilled writer able to produce forceful legal arguments in a signature-ready brief or objective legal analysis in an office memorandum.... The documents Roger produces are clear, persuasive and well organized.... He recognizes and understands nuances in the law that can make the difference between winning and losing.... My practice focuses on products liability, medical malpractice and other torts. Over many years, I have relied on Roger for my most complicated legal research and writing projects. His work is excellent. He never misses an agreed-upon deadline. I highly recommend his services." Kerry Choi, Massachusetts attorney specializing in products liability and medical malpractice. Roger and I worked together for 26 years at a mid-size law firm. ...Roger researched legal issues and wrote briefs, memoranda of law or internal memoranda for me in a number of contentious matters involving different areas of the law. Roger’s writing is superb. He writes with great authority and is direct and to the point. ... Roger is always easy to work with and responsive to requests. He dependably produces the work in a timely manner. He is also a good editor, is cost-effective, and works well as part of a team. Roger is a unique lawyer with a unique skill set. I highly recommend him and would not hesitate to call upon him." Roger is the best writer/researcher I have ever worked with. His timelines are always met, his input and analysis invaluable." I have worked with Roger for many years. He is, without question, the best legal researcher and writer that I have ever known. He has the ability to quickly identify critical issues, efficiently and exhaustively research the relevant issues, and produce briefs and memoranda that are both clear and persuasive. He has, on numerous occasions ..., produced work that impressed not only clients but opposing counsel. He is professional and a pleasure to work with. He is extremely organized and dependable and excels at working under pressure to meet deadlines...."
Roger is, without doubt, the best legal researcher and legal writer that I have ever encountered. His work helped enable our small firm to litigate and win cases against much larger firms having greater resources. In short, Roger leveled the playing field. I and other shareholders consistently relied on Roger to perform the firm’s most difficult and demanding research and to draft its most complex pleadings, appellate briefs, motions and other documents...."
Can a Criminal Conviction or Guilty Plea Give Rise to Issue Preclusion? What Is Judicial Estoppel And When Do Courts Apply It? 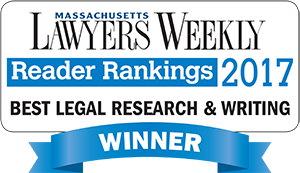 Lawyers' Legal Research and Writing (LLRW) provides legal services only to other Massachusetts attorneys and does not enter into any relationship with the clients of the attorneys to whom it provides services. This Website presents general information about LLRW and is not intended as legal advice, nor should you consider it such. The articles and blog entries on this site are neither advice nor opinion on specific legal questions, but are furnished only as general information on areas of interest. The applicability of the legal principles discussed in the articles, blog entries or elsewhere on this Website may differ widely in specific situations. LLRW uses reasonable efforts in researching, collecting, preparing and providing quality information and material on this Website, but LLRW does not warrant or guarantee the accuracy, completeness, adequacy, appropriateness, applicability or currency of the information contained in this Website. THE MATERIALS IN THIS WEBSITE ARE PROVIDED “AS IS” AND WITHOUT WARRANTIES OF ANY KIND. This Website may constitute attorney advertising. Lawyer's Legal Research © 2012 All Rights Reserved. | Online presence by Cloud a la Carte. Photographs of Roger Manwaring by David Parnes Photography.